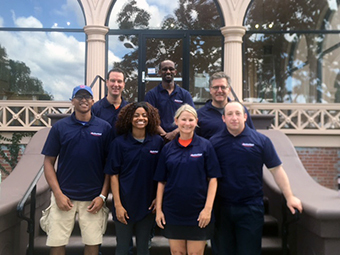 ActioNet’s CICDIM Contract Project Management team spent August 28th working together to give back to the community in Baltimore. While our daily mission is to serve the CMS Center for Innovation in its pursuit of achieving the Triple Aim better serve Medicare beneficiaries, our PMs took “Work Hard, Play Hard” and spent the morning in service together. 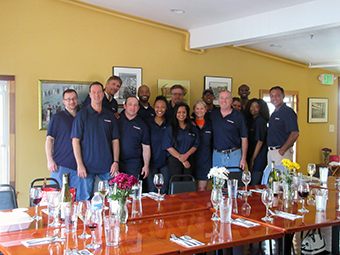 In addition to great fun and time together, ActioNet helped to serve 600 lunches and prepped several rooms as part of the Civic Works mission. We had so many PMs volunteer to participate–our teams were divided up among two projects! Our Daily Bread Employment Center aims to empower Baltimore City’s homeless men, women, and families to find stable employment and housing by providing job readiness programs, employment referrals and case management services. Additionally, since 1981, ODBEC has served hot meals annually to the working poor and homeless 365 days a year (over a quarter of a million meals annually!). 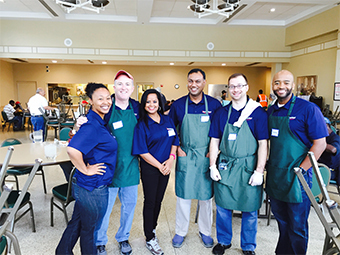 ODBEC’s hot meal program is fueled by volunteers who contribute by cooking, setting tables, serving food and proving a warm atmosphere for the city’s homeless to eat. Our ActioNet group helped in the ongoing restoration of Clifton Mansion in Baltimore as part of the Civic Works community service program. We focused on three rooms on the second floor which will be used as meeting rooms and offices. Specific activities – general cleaning, removal of old stairs, prepping walls for painting, and relocating historical furniture and ornamental decorations. The City of Baltimore purchased Clifton Mansion and its grounds in 1895 from Johns Hopkins University. It has been put to many uses ever since, including a headquarters for the Department of Recreation and Parks, and the clubhouse for the golf course. Although the Clifton Mansion fell into considerable disrepair during its years of transition, the building is in being carefully restored by Civic Works and the Friends of Clifton Mansion. 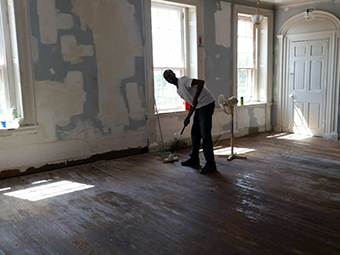 Renovation of the mansion will ensure the future of this important Baltimore landmark and will also enhance the capacity of Civic Works’ programs. Civic Works strengthens Baltimore’s communities through education, skills development, and community service. They are a non-profit working in Baltimore communities for over 20 years. Their programs deliver tangible results through a combination of job training, skills development, and community service.